Waddy is an American session guitarist, composer, and record producer. He is as iconic a rock guitarist as there is! Chances are if they play folk or rock and roll and you’ve heard of them, Waddy has played with them. Waddy’s passion for music and his ease of movement through a variety of genres has made him one of the most in-demand session musicaians on the west coast throughout his career. He has played with such high profile rock musicians as Linda Ronstadt (Waddy was her lead guitarist for years), Stevie Nicks (currently Waddy is Stevie’s main lead guitarist), Keith Richards, James Taylor, Iggy Pop, Warren Zevon, Bryan Ferry, Jackson Browne, and more, both in the studio and on tour. As a composer, Wachtel co-wrote several songs with Zevon including "Werewolves of London," for which he wrote the opening verse, which was voted by BBC Radio 2 listeners as the greatest ever in 2004. He co-wrote the Warren Zevon song "Things to Do in Denver When You're Dead." Waddy performed and co-produced the first two Zevon albums, considered his classics, and was a major contributor to the Warren Zevon sound. Zevon complimented Wachtel on a radio interview with Redbeard in the Studio, when he said that introducing anyone to Wachtel was a wonderful thing to do, and that he'd met a lot of musical connections through him. 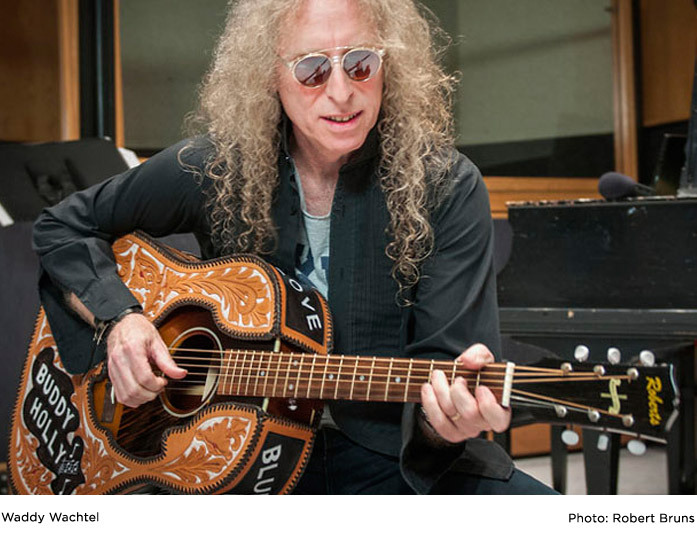 Wachtel has toured with the Everly Brothers, Carole King, James Taylor, Linda Ronstadt, Adam Sandler, Stevie Nicks, and Keith Richards (in the X-Pensive Winos). His distinctive guitar sound, vocal harmonies, arrangement techniques and the ability to add exciting guitar riffs to headlining performer's gigs made him much sought-after in the world of live tours. He was also called upon during many of his tours to be Musical Director, using his talents and sensitive musical ear to bring all the musicians on the tours into accord with the music. Waddy has toured with Stevie Nicks for many years, serving as bandleader, musical director, and lead guitarist. He has also appeared on each of her solo albums and on several television shows. Among the artists and bands he has worked with are The Everly Brothers, Jackson Browne, Kim Carnes, Rosanne Cash, The Church, The Cowsills, Bob Dylan, Silver Condor, Gilby Clarke, Melissa Etheridge, Bryan Ferry, Bernard Fowler, Andrew Gold, Don Henley, Carole King, Miranda Lambert, The Motels, Maria Muldaur, Randy Newman, Steve Perry, Iggy Pop, Bonnie Raitt, Keith Richards, Linda Ronstadt, Adam Sandler, Bob Seger, Carly Simon, The Rolling Stones, James Taylor, Tom Waits, Warren Zevon and Laura Allan. I consider it such a special honor to have been able to spend time getting to know Waddy and his musical preferences, and to have had the opportunity to develop a common vocabulary with Waddy which allowed me to build him a truly custom BH J-45 which would directly manifest the things that Waddy expressed he wanted in an acoustic guitar. I want to thank Waddy for giving me such an amazing opportunity as a luthier! 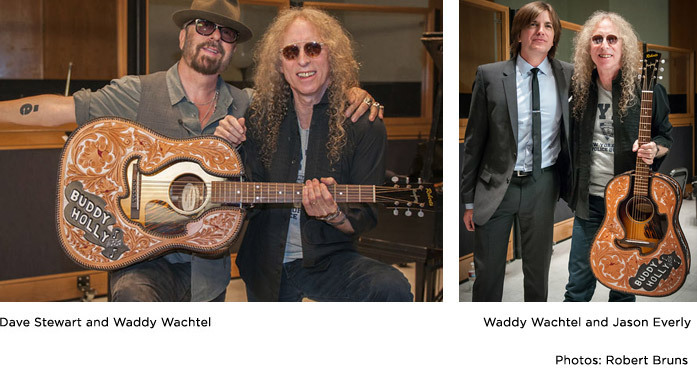 Waddy is a truly great ambassador for The Buddy Holly Educational Foundation as well!